This article reviews the various forms of steel construction products and describes how they are produced. Material properties for the products are discussed in a separate article. Steel is a strong material that is highly resistant to shaping at normal temperatures but this resistance lessens considerably at higher temperatures. 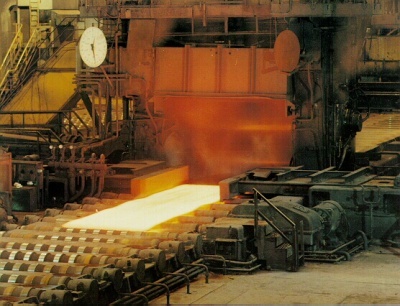 For that reason the billets, blooms, beam blanks and slabs from the steelmaking process are shaped into basic products at carefully controlled elevated temperatures. 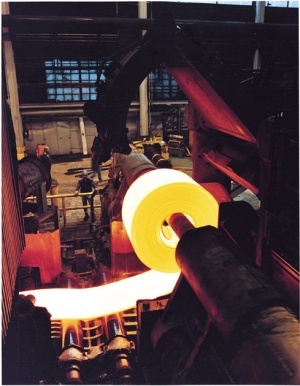 The method that is most commonly used for shaping is to heat the steel to around 1,280°C in a reheat furnace and then roll the steel, squeezing it between sets of rolls. Rolls are arranged in pairs, either just horizontally or both horizontally and vertically, and housed in a 'stand'. To change the shape of a material as strong as steel the rolls must exert forces measured in hundreds of tonnes, and must also draw the steel continuously through the rolls while reducing the thickness. Two main classes of product are produced - flat products such as plates, sheets or strips of uniform thickness, and long products which are lengths of a particular cross section, ranging from rectangular bars to double flange H sections. For flat products, two horizontal rolls are set one above the other in an open housing. These work rolls that contact the hot steel are often supported by larger diameter rolls to prevent them bending under the rolling loads to ensure a uniform thickness product. For long products there are two types of mills; structural and universal. 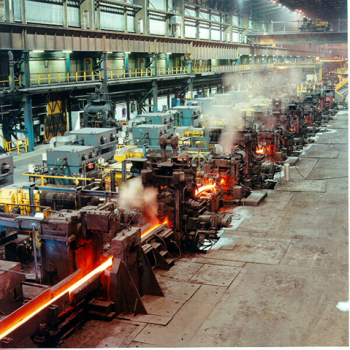 In a structural mill there are multiple stands each containing specially shaped rolls where the full set of rolls gradually shape the hot steel in successive passes through separate roll gaps. The product passes through each roll gap only once. In a universal mill the stands contain both vertical and horizontal rolls and the hot steel passes backwards and forwards through the same mill multiple times with the shape being formed by reducing the gap between rolls on successive passes. The figure shows the stand in a universal mill used to create open sections. Close control of chemical composition is maintained to produce clean steels with consistent strength and toughness properties that meet all relevant national standards, as with all structural products, and state-of-the art levellers produce flat plates with controlled residual stress. 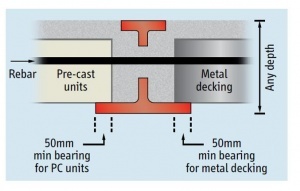 A roughing stand reduces the continuously cast slab to an intermediate size by a series of reversing end-to-end passes through the mill. This intermediate slab is then rolled to its final size in a finishing stand. In the continuous hot-dip galvanizing process, coils of rolled steel are continuously unwound and fed through cleaning and annealing sections before entering a molten zinc bath at speeds up to 200 metres per minute. As the steel exits the molten zinc bath, gas 'knives' wipe off the excess coating from the steel sheet to control coating thickness. The steel strip then undergoes a series of mechanical or chemical treatments. Depending on customer requirements, the coated sheet steel can be passivated, oiled and recoiled, and cut to length and palletized before shipment to the fabricator. All galvanized coatings are metallurgically bonded to the steel they protect. This ensures coating adhesion - critical for manufacturing processes that stamp, roll or draw the steel into its final product shape. The mechanical properties of strip steel used in construction are given in BS EN 10346 and summarized below. Z and ZF, etc indicate the metallic coating applied to the steel, i.e. zinc (Z) and zinc-iron alloy (ZF), zinc-aluminium alloy (ZA), zinc-magnesium alloy (ZM), aluminium-zinc alloy (AZ) or aluminium-silicon alloy (AS). The amount of metallic coating applied to the steel varies depending upon the coating applied and the application. For strip steel construction products the common coating weight applied is 275 g/m² of zinc. This is the total coating weight over both surfaces. It is specified as Z275. For internal, light gauge, non-loadbearing components, such as stud partitioning, the standard coating weight is Z140. In the final production process, the coils of steel are uncoiled, slit into appropriate widths and then cold, roll-formed into the final product form. Some smaller more complex products, such as lintels, are formed using a press brake. 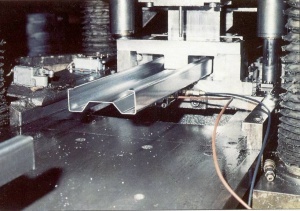 The image shows a purlin being roll-formed from hot-dip galvanized strip steel. Open sections range from large beams and piles, which are mainly used in construction, down to smaller products including rails, rods and bars. Various types of mill are used to produce different long products. Heavy section and medium section mills have three or four stands with grooved rolls corresponding to the initial roughing, and the intermediate and finishing stages of rolling. Beam mills include stands with both horizontal and vertical rolls bearing on the workpiece. High speed rod and bar mills are used to roll products in small sizes, sometimes square or hexagonal, as well as rounds. Dimensions for design and detailing are given in SCI P363 . Hot rolled open sections are produced in lengths up to about 25 m. A nominal yield strength of 355MPa is most commonly used in construction, although S460MPa sections are also available. Such sections are typically supplied in either the As Rolled (AR) or Thermomechanically Rolled (TM) supply conditions, and are rolled from continuously-cast blooms, billets or ‘dog bones’. European beams (IPE, HE and HL sections) and columns (HD sections) are also defined in BS EN 10365. Asymmetric steel beams are often used as part of a shallow floor system. Their key feature is a wider bottom than top flange, which enables the slab to sit on the upper surface of the bottom flange with adequate bearing, rather than the upper surface of the top flange as found with downstand beams. The floor slab in such systems may be in the form of a precast concrete slab or a composite slab with metal decking (either shallow or deep decking may be used). A number of asymmetric shallow floor beams are available, including Ultra Shallow Floor Beams (USFB) from Kloeckner Westok, and ArcelorMittal's Slim Floor. Kloeckner Westok’s USFBs are shallow and asymmetric Westok cellular beams, which are manufactured from standard rolled sections, and are available in increments of 1mm depth. They are typically 150-300mm deep and are sized and designed using Westok’s freely available Cellbeam software package. USFBs can economically span up to 10m with structural depths that compare very favourably with R.C. flat slabs. As such, they are popular in many sectors, particularly Education, Commercial and Residential. There are two basic methods of producing hollow sections - the seamless process in which a hole is pierced through a hot solid bar to form the bore and then the bar is rolled to form the round tube, and the welded process in which a steel plate or strip is formed into a cylindrical shape and the edges welded together. The latter is the most commonly employed for structural applications. The High Frequency Electric Resistance Welding (HFERW) method forms the bulk of tube production in small and medium sizes, up to 508 mm in diameter. Steel strip is uncoiled and guided, cold, through sets of forming rolls to produce the cylindrical shape. At the point where the edges meet, a high frequency current is introduced into the edges of the strip, either by induction using an encircling coil or by contacts sliding on the surface of the strip. The electric current produces enough local heat to melt the strip edges as they are forged together. The weld is formed instantly. Pipes of wall thicknesses above 16 mm or with diameters above 508 mm are produced by several consecutive forming processes and Submerged Arc Welded (SAW). Square and Rectangular hollow sections are 'squared up' by passing them through a suitable series of work rolls that progressively changes the shape. This reduction and reshaping process can be carried out hot or cold, which results in the distinction between 'hot finished' and 'cold formed' products. For a cold formed rectangular section, the corner radius is not as tight as can be achieved with the hot process (which makes it easy to distinguish the two types visibly). Hollow sections are typically produced in lengths 6m - 14.5m, depending on the size and thickness. A nominal yield strength of 355MPa is most commonly used in construction, although 420MPa hot finished hollow sections are also available. Hollow sections are typically defined by a serial size comprising the outer dimension(s), and the wall thickness. Dimensions for hollow sections are defined in BS EN 10210-2 for hot finished sections and BS EN 10219-2 for cold formed sections. The definitions cover a very wide combination of cross sectional width and wall thickness; only a limited selection is manufactured and that selection may change from time to time, depending on demand and commercial judgment. As well as resulting in differences in dimensions (and thus section properties) between hot and cold rectangular dimensions, the choice of process affects residual stress in the section and this leads to a requirement in BS EN 1993-1-1 for different buckling curves. Hence, substitution of hot-rolled sections with cold-formed sections should not be done without checking the implications on the design first. Tata Steel produce their hollow sections under the trade names Celsius® 355 NH for hot finished sections and Hybox® 355 for cold formed sections. 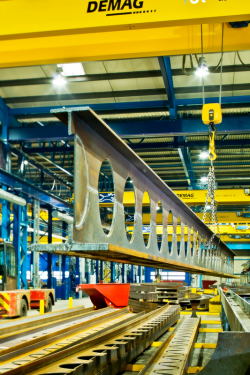 Modern plate girders are fabricated by welding together two flanges and a web plate. Plate girders are used where standard rolled sections are inadequate in terms of load carrying capacity or stiffness. Typical uses include long-span floors in buildings, bridges and crane girders in industrial buildings. Plate girders are designed to resist the applied actions using proportions that ensure low self-weight and high load resistance. 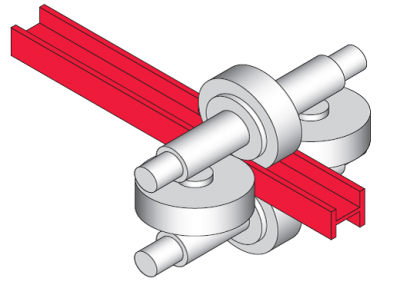 For efficient design it is common to use a relatively deep girder to minimise flange area for a given applied moment. A deep girder also provides a deep web whose area may be minimised by reducing its thickness to the minimum required to carry the applied shear. Such a deep web may be quite slender (a high web depth to thickness ratio) and may be susceptible to shear and local buckling. It is therefore relatively common to provide transverse or longitudinal stiffeners. Cellular beams, with regularly spaced holes in the web of an I-section beam can be produced in one of two ways. By cutting along the web of a beam section (usually a universal beam) to a particular profile, separating the two parts and then welding these Tee sections back together to form a deeper beam section. This process is illustrated below. 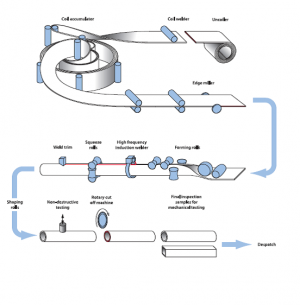 Usually, a single section size is used for both halves of the cellular beam but asymmetric sections can be created by using different rolled sections for each part of the new section. 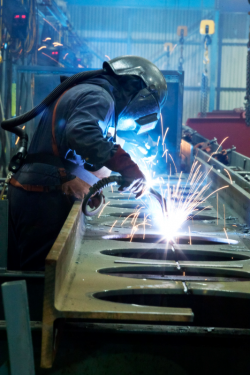 These fabricated sections are produced by specialist companies such as Kloeckner Westok, Fabsec and Jamestown and are purchased by the steelwork contractor to be fabricated into elements for a specific project. A very wide range of lightweight structural sections is produced by cold forming thin gauge strip material to specific section profiles. These are often termed light steel sections. In most cases, galvanized steel strip material is used. 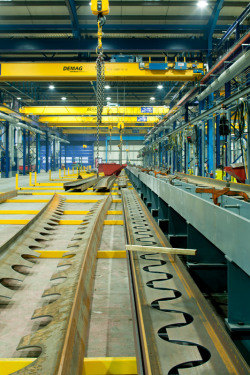 Light steel sections are produced in high volumes by cold rolling and in low volumes by press braking. Thicknesses typically vary from 1.2 to 3.2 mm. Light steel sections are manufactured by many different companies and the profile shapes and section sizes vary. The most common sections are illustrated right; the use of lips at free edges and indented profiles (such as shown in the middle example below) allow the use of thin elements that do not fail prematurely by local buckling. Light steel sections are widely used as secondary structural steelwork in single-storey buildings. Thin gauge galvanized steel strip is also cold formed into sheets with a regular profile. Such sheets were first produced with a simple curved profile and are well known as 'corrugated roofs'. Today more efficient profiles have been developed for use as roof sheeting, wall cladding and decking for floors and are produced by a range of specialist manufacturers. Profiled sheeting for floors is primarily intended for use with concrete to create a composite floor slabs. 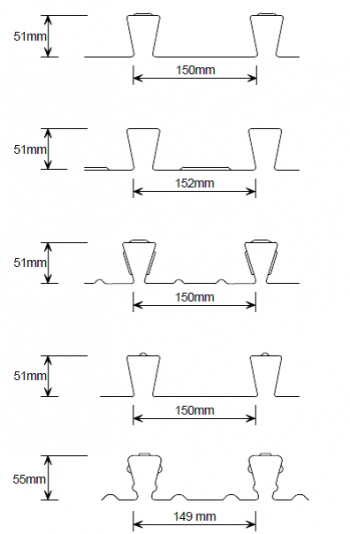 There are two broad classes - shallow profiles, up to about 175 mm deep, which are used for short span applications, and 'deep decking', typically 225 mm deep, for longer spans. Shallow profiles are usually either of 'trapezoidal' or 're-entrant' profile, as shown below. Deep decking is a trapezoidal profile, with indentations and embossments that are intended to improve the structural performance. Most profiles are manufactured from strip no thicker than 2 mm. Profiled sheeting is frequently used to form the weathertight building envelope and for this purpose sheets are produced with profiles that are efficient in spanning between supporting members and in channelling run-off, in sizes that are readily handled on site and which are easily lapped during installation. Since the envelope forms a major visible feature, coloured coating systems are offered. Built-up sheeting systems comprise two separate profiled sheets, an external sheet, which is highly profiled, and a lightly profiled inner liner sheet. The sheets are separated by spacer rails and insulation. The liner sheet and spacers are fixed to structure and the external sheet is fixed to the spacer. The normal method of attachment is by self-drilling, self-tapping screws. Composite panel cladding systems are produced as a sandwich construction comprising two profiled sheets bonded either side of an insulating core of foam, mineral fibre or similar material. Because the panels act compositely, shallow profiles can be used. Individual manufacturers produce a wide range of cladding and roofing systems and provide comprehensive literature with fixing details and tables showing safe loads. More comprehensive information on cladding systems can be found at Tata Colorcoat online. Stainless steel is the name given to a family of corrosion and heat resistant steels containing a minimum of 10.5% chromium. There is a wide range of stainless steels with varying levels of corrosion resistance and strength, as a result of controlled alloying element additions. To achieve the optimal economic benefit, it is important to select a stainless steel which is adequate for the application without being unnecessarily highly alloyed, and hence costly. Stainless steels are suitable for structural applications requiring long life, good corrosion resistance and/or a high-quality surface finish. Austenitic stainless steels are generally selected for structural applications which require a combination of corrosion resistance, formability and excellent field and shop weldability. Where higher strength is required, then duplex stainless steels are most suitable as cost savings are often possible through use of thinner sections. The following stainless steels are most commonly encountered in structural applications (although advice on the use of ferritic stainless steel in structural applications is also now available). 1.4301 (formerly known as 304) and 1.4307 (formerly known as 304L) 1.4401 (316) and 1.4404 (316L) Types 1.4301/1.4307 are the most commonly used standard austenitic stainless steels and contain 18-20 % chromium and 8-11 % nickel. Types 1.4401/1.4404 contain about 17-18 % chromium, 8-11 % nickel and the addition of 2-3 % molybdenum which improves corrosion resistance. Note: 1.4307 and 1.4404 are low carbon stainless steels with reduced risk of sensitization and improved weld corrosion resistance when section thicknesses greater than about 3 mm are welded. When producers have state-of-the-art production methods, commercially produced stainless steels are often low carbon and 'dual certified' to both designations. When less modern technology is used, this cannot be assumed and there may be a price premium for the low carbon specification. So, the low carbon version should be explicitly specified in the project documents when heavier sections are to be welded. 1.4162 (widely known as LDX 2101®) 1.4462 (2205) 1.4162 is a duplex stainless steel with a lean chemical composition. It has high strength, characteristic of all duplex stainless steels, with a corrosion resistance lying between 1.4301 and 1.4401 austenitic stainless steels. All duplex steels are weldable, and have approximately twice the proof strength of austenitic stainless steels. They are therefore well suited for use as structural sections. Sheet, plate, bar and circular hollow sections are all widely available in the stainless steels mentioned above. A range of structural sections (I-sections, angles, channels, tees, rectangular hollow sections) are stocked in the austenitic grades. A standard range of duplex stainless steel sections are available from selected producers and stockists, and sizes outside of the standard range can be made by special order. 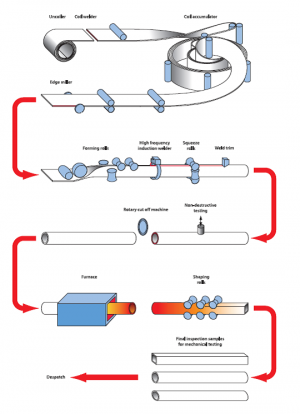 Generally, sections may be produced by cold forming, hot rolling, extrusion, welding or laser fusing. In some cases, particularly with very complex details, a steel casting may be more effective than a fabricated part. Steel castings are formed by pouring molten metal into a mould containing a cavity which has the desired shape of the component. The liquid metal cools and solidifies in the mould cavity and is then removed for cleaning. Heat treating may be required to meet desired properties, but there is no need for subsequent hot or cold working. Castings can be produced as one off components or in many thousands. They can be made in a wide range of sizes and weights, the upper limits being governed by the particular casting process used, and the required mechanical properties and surface finish. It is possible to achieve high strength, high ductility and high toughness in the cast form. Castings can have excellent surface finish and good welding and machining characteristics. Castings can operate at high and low temperatures, under high pressure and in severe environments. They do not exhibit the effects of directionality on mechanical properties that exist in some wrought steels. Providing the correct grade of material is selected and an appropriate inspection and testing regime implemented, there is no reason why the composition, properties or performance of castings should be inferior in any way to that of fabricated components. The mechanical properties, quality, integrity and consistency of cast steels are generally comparable with those of hot rolled and fabricated structural steels. Further information on castings in construction is given in SCI P172. The most commonly used fastener in steel construction is the familiar nut-and-bolt. Bolts are manufactured by forging from round bar sections, usually with a hexagon shaped head. The steel material for bolts has a higher strength than ordinary structural steel, usually with an ultimate tensile strength of 800 or 1000 N/mm² and the material for nuts has a similar or higher strength. There is a range of international standards for the materials and dimensions of bolts and nuts, including the various standards that define the thread form. There are numerous proprietary fasteners for special applications, such as for blind fixing or for connecting parts without drilling holes, and fixings for attachment to concrete foundations or other structures. Dimensions and properties of these fasteners and fixings are provided by the manufacturers. The requirements for chemical composition and mechanical properties of stainless steel fasteners are specified in BS EN ISO 3506. The Standard was revised at the end of 2009 (and is currently undergoing a new revision which will include duplex steels for the first time) and now comprises four separate parts. Part 1 covers bolts, screws and studs; Part 2 covers nuts; Part 3 covers set-screws; and Part 4 covers self-tapping screws. In this Standard, bolts, screws and studs are designated by a letter followed by three numbers, e.g. A2-70 or A4-80. The letter refers to the group of stainless steel: austenitic (A), martensitic (C) or ferritic (F). The letter is followed by a number (1, 2, 3, 4 or 5) which defines a composition range. The final two numbers denote the property class, which describes the mechanical properties of the bolt, screw, stud or nut - see the table below. Mechanical properties of austenitic grade bolts, screws, studs and nuts to BS EN ISO 3506. For most structural applications, it is generally recommended that austenitic bolts grade A2 or A4 and property class 70 or 80 are used. Steels of grade A2 have equivalent corrosion resistance to grade 1.4301. Steels of grade A4 contain molybdenum and have equivalent corrosion resistance to grade 1.4401. Property class 70 fasteners are made from cold drawn bar. Property class 80 fasteners are made from severely hard cold drawn bar, with mechanical properties similar to carbon steel and alloy steel grade 8.8 steel bolts to BS EN ISO 898. When choosing a stainless steel fastener, consideration should be given to matching the strength and corrosion resistance of the bolts and parent material. To avoid the risk of bimetallic corrosion stainless steel bolts should always be used when connecting stainless steel members. Stainless steel bolts are also suitable for connecting galvanized steel and aluminium members. 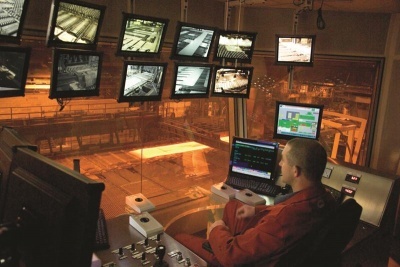 voestalpine Metsec plc is one of the UK’s biggest construction specialist cold roll-forming companies, and part of the largest globally leading technology and capital goods group. Providing products for the construction and manufacturing industries, we focus on adding value through expert design, precision manufacturing, and on-time in full product delivery. ↑ BS EN 10056-1:2017 Structural steel equal and unequal leg angles. Dimensions, BSI. ↑ BS EN 10210-2:2006 Hot finished structural hollow sections of non-alloy and fine grain steels. Tolerances, dimensions and sectional properties, BSI. ↑ BS EN 10219-2:2006 Cold formed welded structural hollow sections of non-alloy and fine grain steels. 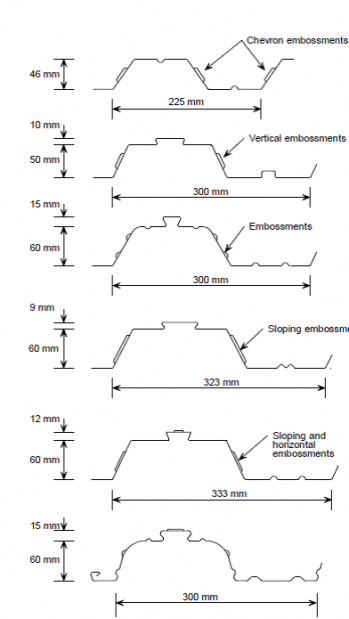 Tolerances, dimensions and sectional properties, BSI.